Staging Solutions of Houston, TX provided support for the 2007 HP Technology Forum and Expo at the Mandalay Bay Events Center.The hottest corporate ticket in town was a badge for the HP Technology Forum and Expo at the Mandalay Bay Events Center. HP employees attending another HP event across town pleaded for day passes from the fortunate Tech Forum badge holders so they could witness the HP Technology Forum and Expo, which was designed and produced by Staging Solutions of Houston, TX. The logistics to execute this 7,500 person event, with daily General Sessions, more than 47 comprehensive breakout/training sessions and 53 hands-on labs impressed even skeptical Las Vegas hotel executives who had claimed to have seen it all. The set design was a platform to display cutting edge technology solutions to the attendees using a 20 x 36 foot motion controlled LED wall, two 25 x 75 foot multimedia projection canvases, two 8 x 8 foot hydraulic platforms used to reveal products & demos, and a multi tiered curvilinear stage to bring the presenters into the audience with multiple dramatic entrance opportunities. Lawson explained the video setup, "The video components were a major part of driving the message home and we had two 25 X 75 foot wide panned rear projection screens with 12 Barco R20's (double stacked) on multi level sections of scaffolding that had to be built into the bleachers behind the screens. This was very difficult because of railings, strange angles, different heights of each projector stack and being right at the end of the lens on our throw. We used six Grass Valley Turbo media playback machines running dual channels simultaneously, all synched and managed with a Fresco System controller. All the media was in HD." 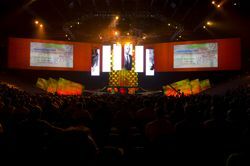 The set design featured a 20 x 36 foot motion controlled LED wall, two 25 x 75 foot multimedia projection canvases, two 8 x 8 foot hydraulic platforms used to reveal products & demos, and a multi tiered curvilinear stage to bring the presenters into the audience with multiple dramatic entrance opportunities. Lawson continued, "We also used a Spyder system to switch and route all the sources to the screens and LED wall. The system was maxed out and again we had very little time to program the system prior to install. A luxury again was working with Hugh Howarth and George Scontsas from Jupiter Media that helped with the content. Drew Griffith was my lead video engineer who helped develop the systems and wrangle the video crew onsite. He kept that train rolling and made it happen when rehearsals were right around the corner." A huge part of the show was the LED wall. Lawson said, "The LED wall was a Barco I-lite 7mil, 20 x 36 foot wide. The LED wall was designed to break apart into six - 20 X 6 foot sections that would track both vertically and horizontally using multiple winch and track systems provided by Showrig out of Las Vegas. They used proprietary software from Fisher Controls to program the movements of the LED walls." 12 Barco R20's double stacked on multi level sections of scaffolding had to be built into the bleachers behind the screens. Lawson explained the complexity of the gear and the event itself, "We were using Technology that was very new by most standards to our industry, in particular to corporate events and pushing them to maximum limits. The vertical movements along with horizontal movements created timing and content challenges from a corporate messaging perspective. These were all details that could not be overlooked and working with Jupiter Media, who created all the HD imagery, was a true pleasure. They understood what our approach was from the start and that made transitions, timing, and onsite edits work smoothly. "What made this signature event truly amazing was the production schedule. The green light was given to Staging Solutions production team only six short weeks prior to the event itself. Accomplishing what few companies could, Staging Solutions produced and executed the "HP Tech Forum" from concept to completion in only 42 days. Technical director for the show, Mark Perkinson, explained the situation, "The upshot was it took significant time in the small window available to come up with a design and get it approved, which left scant little time to plan pre-production details with the various team players. Little more than a month from load in the client asked us to 'pull out all the stops' as it were and create something on a very grand scale. They wanted to be wowed. It was clear to me very early we'd have to work round the clock shifts for at best the 1st 48 hours, if not more. That in turn stressed budgets created long before the 'wow us' mandate both for overtime requirements as well as a required doubling of supervisory labor in each department." An appearance by the HP Orange County Chopper custom motorcycle made a dramatic entrance, rising on a hydraulic lift during the introduction of Todd Bradley, leader of the HP Personal Computing Group. Perkinson continue, "Vegas is blessed w/ very high caliber talent, yet for all that going for us the huge weight of the automation trussing required high steel work which simply took far longer than the entire collaborative team charged w/ rigging believed it would. Eight hours into our load-in we were eight hours behind. Too late to change the subsequent calls of course, so we overcame as best we could by doing the only thing you can do - rely on skills & experience to continually re-prioritize the strategy & hit targets of opportunity as they exist using the talent already booked to be there. I felt for the Showrig guys. They had the largest amount of pressure of us all. The entire design impact of multiple teams of people's work hinged on those screens doing their magic & Showrig's team bore the brunt of all that angst. I don't think any of them slept more than an hour or so in 72 hours straight. There were aspects of the automation control, which were being prototyped on site due to the extremely truncated pre-production schedule. To their credit, the opening went off safely, and virtually flawlessly. But there is nothing more valuable on site than additional time. It's like the old military adage, 'No battle plan survives the first shot.'" For more information visit www.StagingSolutions.com.